I know spool caps might not be the height of conversation at dinner parties but selecting the wrong size to use on your sewing machine may cause tension issues. As the owner of two sewing machine dealerships, I hear about tension issues on sewing machines a lot. You want to choose a spool cap that is the same size or smaller than the spool of thread that you are using. Maybe you bought a Janome machine and it came with some of these little guys. Most people have no idea what they are or when to use them. 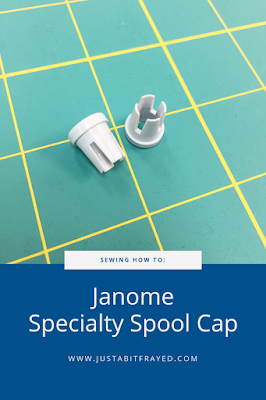 These are the Specialty Spool Caps from Janome. 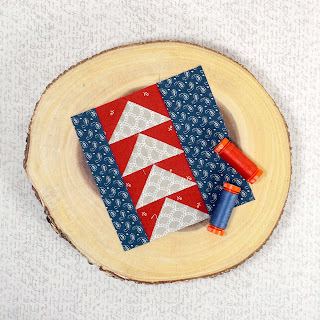 These are the perfect size to use with Aurifil large spools and Mettler Metrosene threads. You can see in the photo just how nice these fit on the end of the spool. This is perfect for making sure that the thread comes off the spool smoothly all the way to the very end! 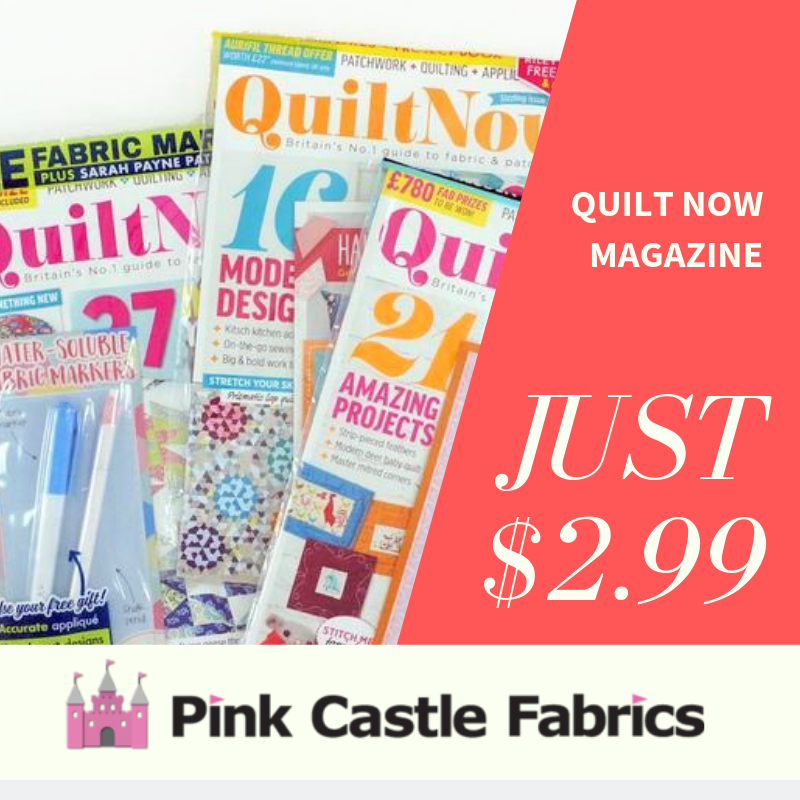 If these didn't come with your machine you can pick them up here at Pink Castle Fabrics. This month our Modern Quilt Guild is doing a zipper pouch swap. 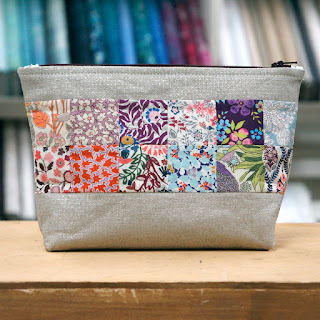 Apparently I had pinned this Zipper Pouch Tutorial by the Sewing Chick more than one time on my Pinterest boards so I'm glad I had a reason to make it. 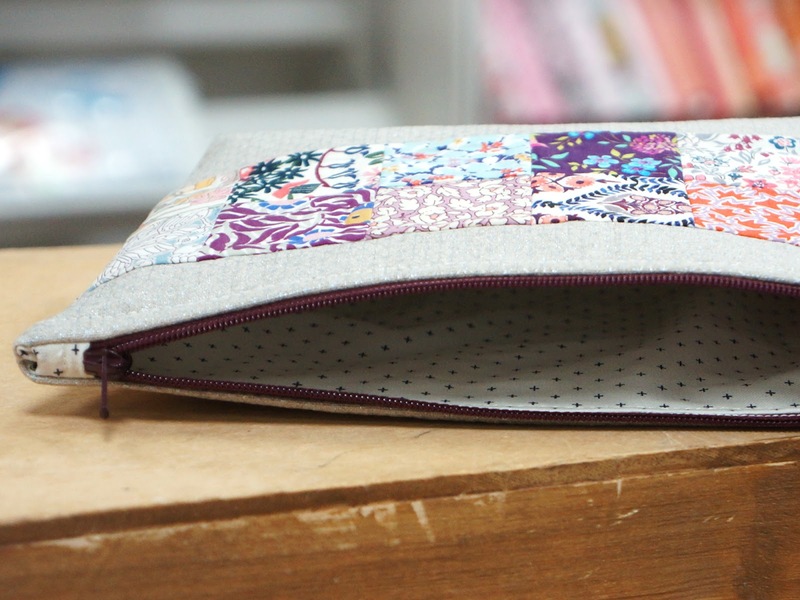 Instead of leaving a hole in the lining of the bag and pulling it through like I have done every other time I've made a zipper pouch, she has you make a small bindings for the linings. It ends up looking nice but it was a bit tedious. I'm sure it didn't help that I was finishing the bag at 11:00 at night. I used some Liberty of London tana lawn scraps and some Cotton+Steel sparkle linen for the outside. And my favorite Add it Up print from Cotton+Steel for the lining. I used fusible fleece for the interfacing instead of ShapeFlex 101. I wanted it to stand up and have some body. I really like the way this turned out! 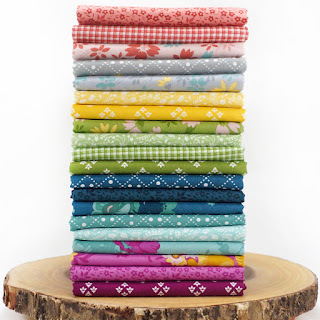 I really like the Liberty scraps too. They are the perfect scale for a little pouch. So this tutorial will show you how to mend your jeans in a much less visible way. You can always use a contrasting color of thread to darn if you want it to stand out. Darning describes a way of mending a hole in a woven fabric using threads or yarns in an interwoven fabric. I always think about darning socks or other knitted things but it can mean any woven fabric. You will want to stabilize the back of the hole and then go over the hole in two different directions. 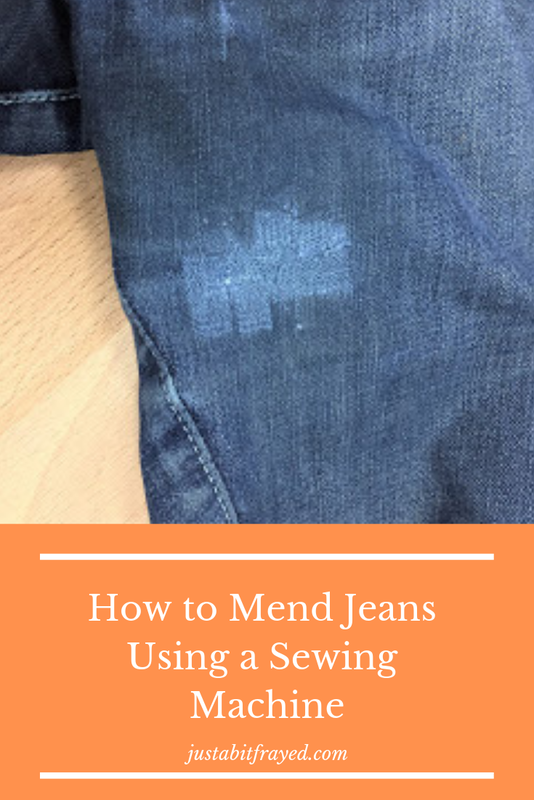 A lot of times when people think of darning they think about stitching by hand but it can also be done with a sewing machine. I'm going to show you how to use the darning stitch on your sewing machine to mend your jeans but you can also go back and forth over your hole with a straight stitch if you don't have a darning stitch on your sewing machine. Choose a thread color that is close to the denim wash.
1. Choose a thread color that is a close match to your denim wash. My jeans that needed a repair are a medium wash and I used Aurifil color #1158 in 50 weight thread. I used 100% cotton thread but any thread should work. 2. Setting up the sewing machine. 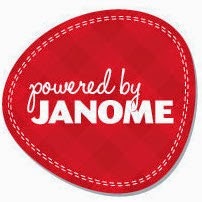 I used the Janome 9400 to repair my jeans but the darning stitch can be found on many sewing machines. I circled the stitch in red on the photo, it's stitch #13 under buttonholes. You can see what it looks like below. On the Janome machines you use the one step buttonhole foot for this stitch. I took the metal stabilizing plate off my buttonhole foot to do this repair. 3. Stabilize the hole. I keep small pieces of Pellon Shape Flex 101 (SF101) left over from other projects and that works really well for mending. Shape Flex is a cotton fabric with glue on one side that you fuse onto fabric to stabilize with an iron. Once you cut out a piece of SF101 (make sure it is bigger than the hole with extra!) fuse it to the wrong side (inside) your jeans. Be careful to try to pull the hole closed a bit. 4. Darn the hole. 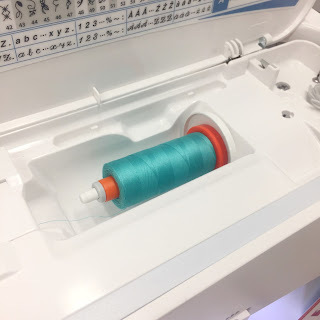 I made a video for you to see how the darning stitch works on the Janome machines. You will most likely (depending on where the hole is in your jeans) need to use the free arm on your machine. I stitched on the right side of my fabric directly over the hole. I had to restart the stitch several times to cover the entire hole. Then you want to go over the hole and your stitches in a perpendicular direction. You will want to turn your jeans 90 degrees and go over everything again. This interweave of stitches will look like the photo below. That's it! Now your jeans are mended! The whole process is quick and easy (especially once you learn how to use the darning stitch on your machine!) and you will get a lot more wear out of your favorite jeans! *extra note* after a few washings the glue on the Shape Flex might come off and the cotton fabric won't be attached anymore on the inside of your jeans. I just cut the SF101 around the darning once this happens. It won't hurt your repair! 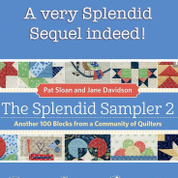 It's the kickoff day for the Splendid Sampler 2! 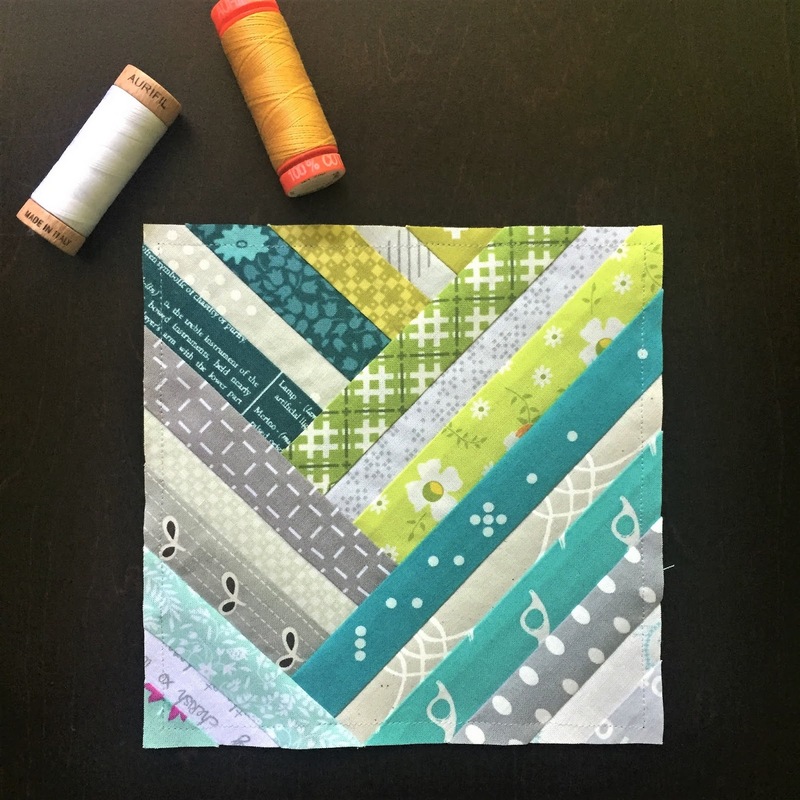 The first featured block is by Alex Veronelli of Aurifil thread fame. And of course I added some of my favorite Aurifil threads to my photo for you. I have been using these Italian threads now for 8 years! See the little wooden spool in the photo? That is the new 80 weight thread! It's sooo thin! 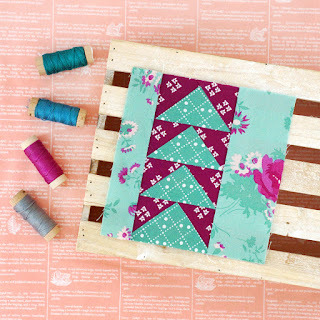 You can use it in your sewing machine (I still used the 50 weight for this block) but I'm excited to try using the thinner weight for some hand stitching on some of these blocks. I'm sure this block could have gone together faster if I wasn't so particular about colors. It was still quick and I used ALL scraps! 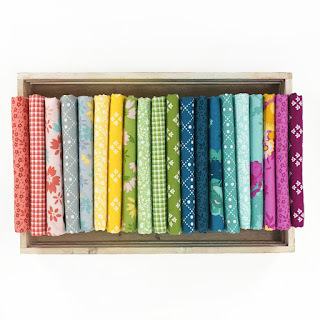 You know I love a good scrap quilt! I'm hoping these blocks help me use up my massive scrap collection. After stitching this block I added a line of stay stitching around the edges. It's just a straight line stitch around the edge of the entire block. With this many seams and some being on the bias it will help my block hold it's shape until it gets sewn up into a quilt! 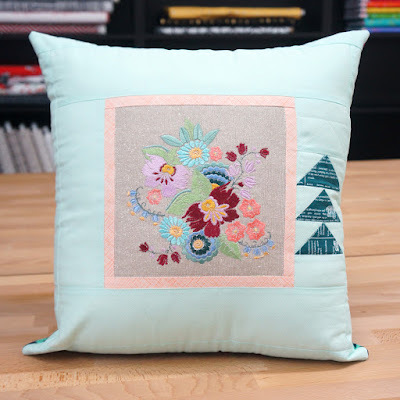 Don't forget to link up your finished block on the Splendid Sampler website!